Dinosaurs, dinosaurs, dinosaurs! Dinosaurs everywhere! In case you haven’t heard, the highly anticipated movie, Jurassic World, was released recently. 🙂 Everyone and their grandmother seems to be excited to go to see it. We weren’t able to see it the first weekend, or even week, that it came out and Cap’n C was beyond excited and even a little impatient to go see it. So for fun build-up (and distraction) we had a week of dinosaur fun. The first thing we did was look back over his history notebook from Dinosaurs Before Dark to talk about what he already knew about dinosaurs and see what he wanted to know about them. 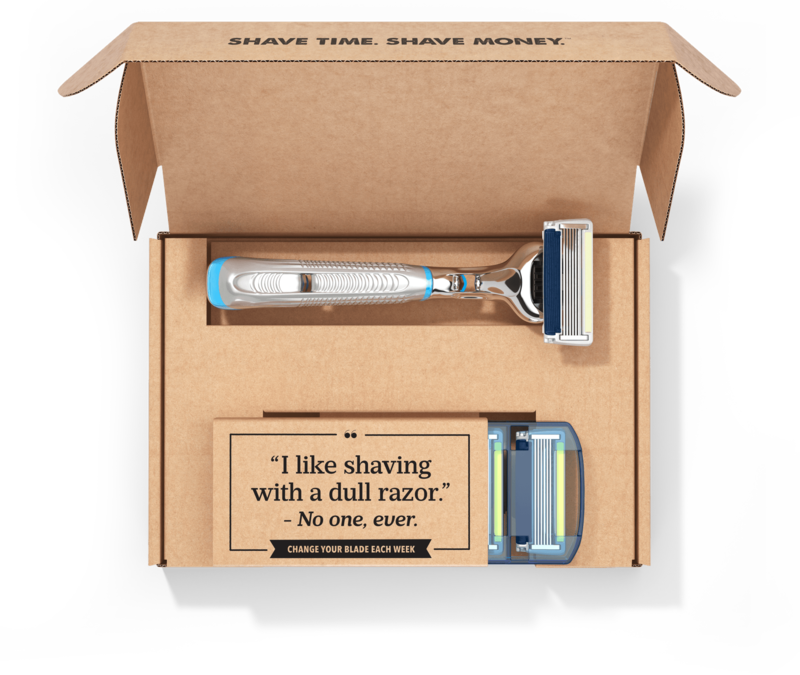 Sometimes a little review can be fun! Next up was the trailer- which we probably watched a half a dozen times! Jurassic Quest happened to be in Billings the same weekend Jurassic World was released, and knowing how much Cap’n C absolutely loves dinosaurs, we splurged a bit and bought tickets to go. It’s a bit like a museum, with dinosaur exhibits and signs to read, with some kiddie rides and inflatables thrown in the mix. There were about 6 dinosaur rides. They move pretty slow, so they are good for even the smallest kiddos. 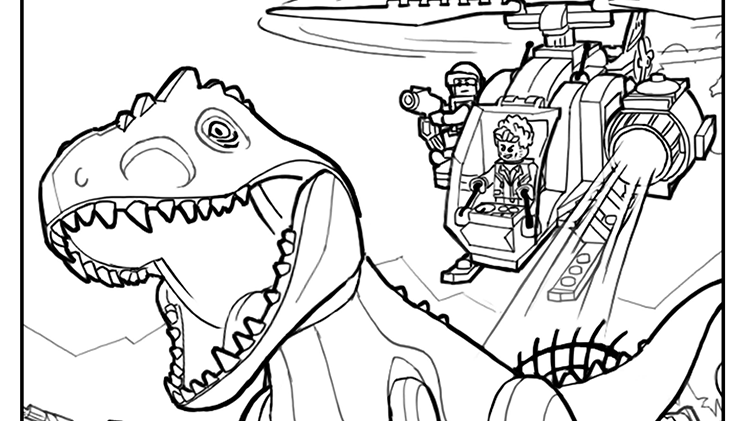 The lines for 3 (triceratops and the 2 T-rex’s) are usually the longest but all the kids want those. All the rides and activities like the bungee run or fossil dig require buying tickets or getting the VIP pass. We went ahead and got the VIP pass for Cap’n C and regular passes for the rest of us. The majority of the activities are aimed at the younger kids. I can’t say that the admission cost (avg. $15-20 per person) is worth what you see/get to do, but Cap’n C had a blast, so sometimes that alone makes the cost worth it. 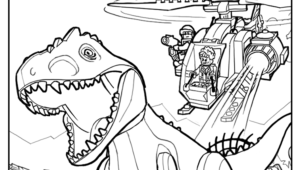 I found some fun Jurassic World Lego coloring pages that he couldn’t wait to do! I have a kid who absolutely loves anything Lego- building with, watching movies of, video games of… if it is Lego, he’s all in! 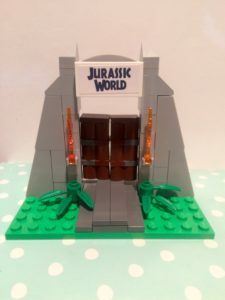 There happens to be a game on the Lego site- Dinosaur Rampage– that you are a dinosaur in Jurassic World who breaks free and is on a rampage. Cap’n C thought that was fun for a little while. This week of dinosaur fun happened to coincide with the Lego Jurassic World event at our local Toysrus, so Cap’n C got to make the Jurassic World gate from a mini Lego set and keep the Legos. Who doesn’t love free Legos?! We even took some time to check out the new Lego Jurassic World sets while we were there. If you have a dinosaur and/or Lego lover like me, then these should provide hours of fun. There’s a good selection of sets already. Cap’n C has his eyes on the Indominus Rex Breakout set, probably because it’s the biggest one, but he’s more likely to get something along the lines of the T-Rex Tracker or Raptor Escape set. 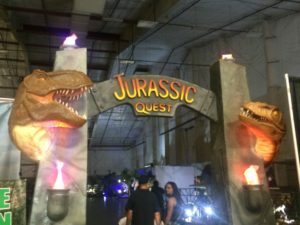 We picked 3 nights throughout the week for movie nights and watched all three prior movies- Jurassic Park, Jurassic Park- The Lost World, and Jurassic Park III. Jurassic World is primarily a sequel to the original movie, so the second and third ones are not necessary to watch prior to going, but we thought a Jurassic marathon would be fun. Did you know there is a website for the Jurassic World theme park? 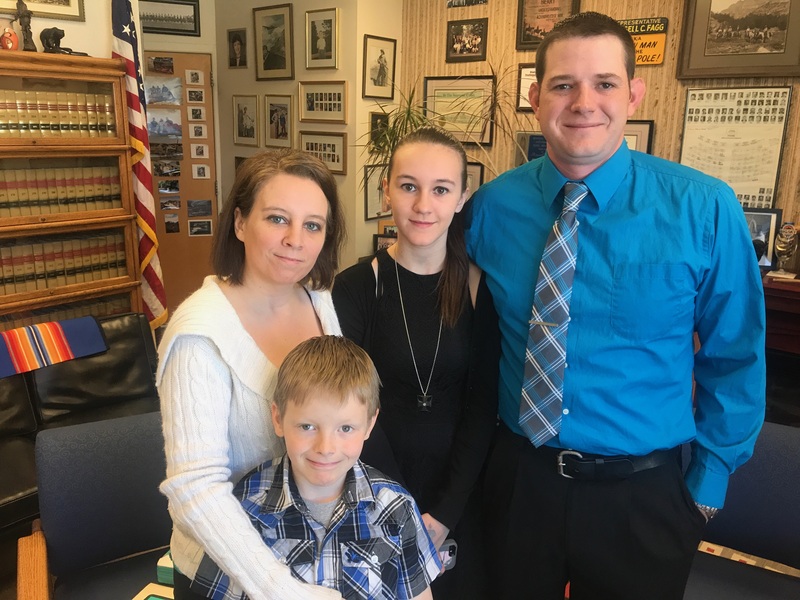 You can go through the site as if planning your own trip there, check out a park map, and the kids page has printable coloring pages, crossword, and a word search. While looking at the website it can give the impression that Jurassic World is a real place. This gave a great opportunity to talk again about the difference between real and pretend or fantasy. Cap’n C understands that it is just a movie and is a place only in the movie, but it can’t hurt to have a reminder conversation. Especially since there are inevitably some scary parts in the movie that it helps little kids to remember that it isn’t real and just a movie. Over the summer and probably during the new school year, we hope to make it to some of the stops along the Dinosaur Trail. Makoshika State Park is only a few hours drive away so the dinosaur museum there will most likely be first on the list. 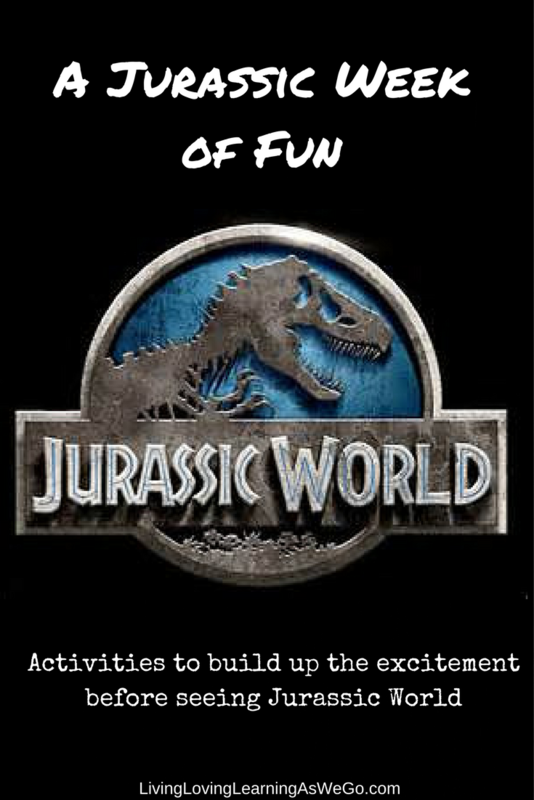 What did your family do to celebrate or get excited about the new Jurassic World movie? ***I do not have any affiliation with Jurassic World production, Universal Studios, or Lego. All opinions are my own and I was not compensated in any way for the mentioning of them.